This limited-edition giclée print is digitally printed in full color on flax linen with a finished hem sewn by the artist. 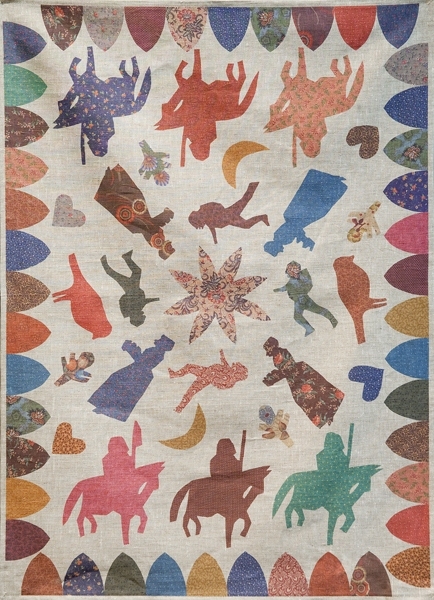 It depicts imagery captured using a unique scanning technology, updating the tradition of "cheater cloth," a printed material meant to look like several different fabrics, usually calicos, appliquéd or patch worked together. The inspiration for this work was derived from a quilt Smith saw at the Shelburne Museum in Vermont, made by a convalescing Civil War soldier; she made her reworked version by cutting out fabrics collected over many years from her and her mother's sewing chests. The original artifact combines Smith's interest in wartime textiles and art made by soldiers in the context of war, and also contains another facet of her research: the history of tradespeople and street peddlers. This print was made as a Special Projects Artist Edition in response to the "American Stories: Paintings of Everyday Life 1765-1915" exhibition at LACMA and is available from the museum for purchase.